Michael Green on the TED stage. Michael Green is the CEO of the Social Progress Imperative, a U.S.-based nonprofit which publishes the Social Progress Index. The index evaluates countries based on their social well-being, from basic survival needs to access to education and healthcare. Green is the co-author of two books: Philanthrocapitalism: How Giving Can Save The World and The Road From Ruin: How To Revive Capitalism And Put America Back On Top. It's the TED Radio Hour from NPR. I'm Guy Raz. And on the show today, how the numbers don't always tell a single story, especially when it comes to measuring progress - even numbers the whole world seems to agree on, like gross domestic product. MICHAEL GREEN: So gross domestic product is a statistical tool created in the 1930s. RAZ: This is economist Michael Green. GREEN: It was not something handed down by God on tablets of stone, as we sometimes talk about it. This is a single tool that tries to measure how much is the economy producing each year, adding up all the different things to produce and saying what's the total value of production of the economy. RAZ: And Michael says that while GDP alone was helpful back then in managing the economy, it has since become the only defining measure of economic progress. GREEN: We divide our world into rich countries and poor countries based on these economic numbers, these GDP numbers. And then we count our success. And we tell the countries that have got less GDP that the thing they've got to do is just get more GDP. And then there'll be a better country. We've ignored the fact that, you know, GDP says nothing about the environment. GDP says nothing about fairness. It's just telling us what's the value of what's being produced in the country every year. So one thing you can find is that it can jump about quite a lot, especially if you get an earthquake or a natural disaster. This happened in Japan a few years ago. Bigger earthquake. So there was a lot of money spent on reconstruction. GDP jumped. So if you're thinking that GDP is progress, you'd have said the earthquakes are good for Japan's progress. Actually, that's a bit weird. Then second - similarly, GDP counts any activity. It makes no judgment about whether the economic activity is productive or not. So if you're spending money on prisons and bombs and tear gas or whatever, all these things may be bad things. As long as they've got a market price and they're part of the production of the economy, GDP's counted them as being a positive step forward. RAZ: So what are we not measuring? GREEN: So things that are essentially exchanged between us, which can be things like community and friendship, the fact that I can rely on a friend or neighbor, the fact that I have a place of belonging. None of these things are being counted. RAZ: Michael Green picks up this idea from the TED stage. GREEN: There have, of course, been efforts in the past to move beyond GDP. But I believe that we're living in a moment when we are ready for a measurement revolution. Today, I'd like to introduce you to the Social Progress Index. It's a measure of the well-being of society completely separate from GDP. It's a whole new way of looking at the world. The Social Progress Index begins by defining what it means to be a good society based around three dimensions. The first is, does everyone have the basic needs for survival - food, water, shelter, safety? Secondly, does everyone have access to the building blocks to improve their lives - education, information, health and sustainable environment? And then third, does every individual have access to a chance to pursue their goals and dreams and ambitions free from obstacles? Do they have rights, freedom of choice, freedom from discrimination and access to the world's most advanced knowledge? Together, these 12 components form the Social Progress framework. RAZ: So - I mean, can everything you measure be measured? Can you quantify it and create data and statistics out of them? GREEN: Well, I think we can do it well enough. So we're very much focusing on the outcomes. So it could be anything like, what's the life expectancy? That's a hard number. What's the high school dropout rate? That's a hard number. You know, what are we - what pollution are we putting into the environment? What's - how many people are dying in road traffic accidents? And then we could also measure things which are more about how people feel. But those things matter. Things like, do people experience discrimination? Do people feel part of a community? And those are survey questions. But they're measuring a critical part of people's real-lived experience. RAZ: So if GDP basically tells us which economies are the largest in the world, it doesn't tell us which countries are the best places to live for just sustainability for our own well-being. It tells us nothing, almost nothing about that. GREEN: Well, it - what we found is that GDP tells us something, but it's not the whole story. So the Social Progress Index shows us that - broadly - countries that are richer tend to have higher social progress. But it's definitely not destiny. So some of the richest countries in the world, like Kuwait and Saudi Arabia, in per capita terms actually have pretty middling levels of social progress. The United States, which has a very high level of GDP per capita, actually is not doing very well compared to other rich countries. On the other hand, we find there are countries that have got a very modest income, like Costa Rica that's got a level of social progress the same as - almost the same as some of the G-7 countries. RAZ: Yeah. I mean, it is amazing that a country like the U.S., which is one of the richest countries in the world, does so badly when it comes to social progress. GREEN: Yeah. I mean, the United States' results in Social Progress Index are actually quite shocking. So the U.S. is the only real major industrial society that we've seen that consistently is underperforming on its social progress relative to its GDP per capita. So the U.S. is basically failing in using its wealth to deliver real quality of life for citizens. So in our rankings, the U.S. is fifth in terms of GDP per capita and 19th in terms of social progress. So it's a really, really strikingly poor performance from the U.S. that I think paints a pretty stark picture. RAZ: Now, somebody might look at the Social Progress Index and say, well, Michael, I mean, you know, the U.S. is a massive country with 300-plus million people, and the countries that seem to be doing well are much smaller, smaller populations, and so, you know, you're comparing apples to oranges. GREEN: Yeah, I mean, big countries do seem to have a harder job. That certainly is the case. But we can say even compared to countries of, you know, that are also of a good size, like the other G-7 countries, even then the U.S. is not doing well. I think the issue we find with the U.S., there's too many people falling off the bottom, achieving very, very low levels of social progress who are being left behind. And that's what's pulling the average numbers down for the U.S.
RAZ: Do you see the Social Progress Index as something that could or should replace GDP or something that can work in parallel alongside GDP? GREEN: Well, we really say mostly that it's there to work in parallel alongside. We've got a system of economic measurement. It's got so many flaws, and we've talked a lot about the flaws. But it's telling us something. What we have to recognize is that it's not telling us the whole story. 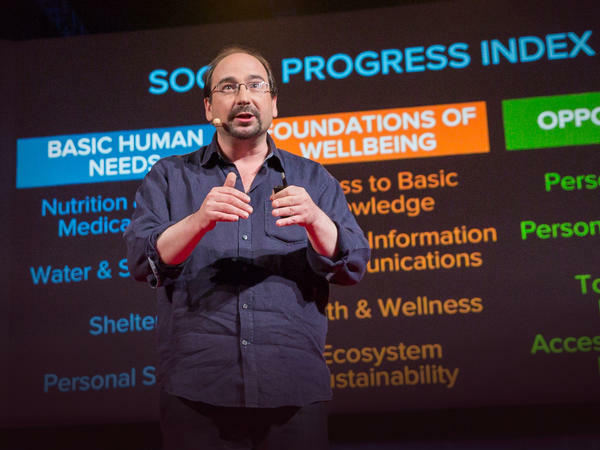 And so by counting those intangible things into tangible numbers through the Social Progress Index, we can actually help communities make choices about where they want to go and what kind of societies they want to build. GREEN: Imagine if we could measure what nonprofits, charities, volunteers, civil society organizations really contribute to our society. Imagine if businesses competed not just on the basis of their economic contribution, but on their contribution to social progress. Imagine if we could hold politicians to account for really improving people's lives. Imagine if we could work together - government, business, civil society, me, you - and make it this century the century of social progress. Thank you. RAZ: Michael Green - he's the CEO of the Social Progress Imperative. You can see his full talk at ted.com. Transcript provided by NPR, Copyright NPR.